Yeah, I am pretty sure that 12.5 is incorrect. I guess it may be possible but this car is essentally the same as the Pontiac G8 GT/GXP and those cars run mid 13s for the GT (6.0L) and low 13s or very high 12s for the GXP (6.2L). I have a G8 GT (A6) with a CAI, headers (stock mufflers), and a tune and it has run a best of 12.58 @ 110mph. That was in great weather and has run a best of 112mph trap speed. 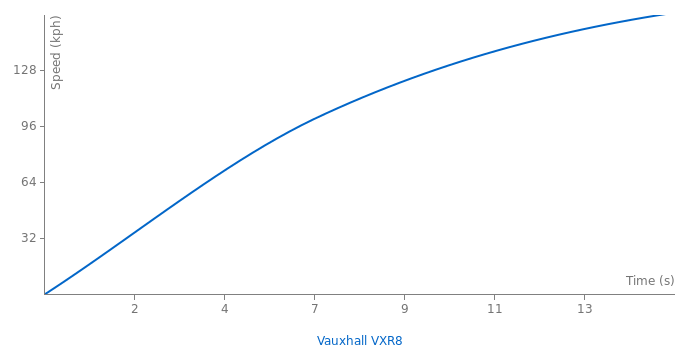 I doubt you could see 12.5s stock in the VXR8. Is there a source for that time? The car pictured is the one i own it was Gm's european show car! 420bhp. The supercharger is an opional extra. Or you can buy the bathhurst which come super charged.Aussi car american engine yes but designed by a scots man! So more that just a badge!! and I should have added... Vauxhall's contribution is the badge. it's our garden variety family car in Aus.... but we're pretty proud of it. Like I was saying.... I'm 100% wrong! I confused myself because the picture originally on this car was of the red car number plate DE51 RED which features in this months EVO magazine..... LORD the Supercharged version is a different car, Vauxhall sell them as different versions as far as I can tell..... I'm talking to them at the moment to get a test drive arranged. I also didn't remember him saying anything about supercharged engine or 530 hp. And I also think both of those lap times are from the one and only VRX8 version which is not supercharged.